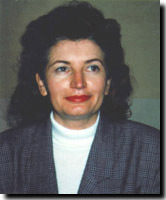 Professor Dragica Brkljac was born 1949 in Krajisnik, attended primary school “Zarko Zrenjanin” in Maglic and grammar school "Jan Kolar" in Backi Petrovac. Graduated in Faculty of Philosophy – Russian language and literature in Novi Sad. She works at school since 1975 and teaches subject Russian language and literature and is a supervisor in SBH. Previous work experiences in primary school in Silbas.